Co-authors Pradeep Ramuhalli (left) and Mahantesh Halappanavar (right). Not pictured: Jamie Coble and Mukul Dixit. In late April, Homeland Security Affairs, the Naval Postgraduate School Center for Homeland Defense and Security’s peer-reviewed online journal, released a supplement showcasing the top-five “Best Papers” resulting from the 2013 IEEE International Conference on Technologies for Homeland Security. 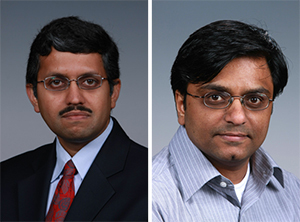 Among the chosen best was “Towards a Theory of Autonomous Reconstitution of Compromised Cyber-Systems,” authored by Pacific Northwest National Laboratory scientists Pradeep Ramuhalli (NSD, Applied Physics), Mahantesh Halappanavar (CSMD, High Performance Computing), Jamie Coble (formerly PNNL, now University of Tennessee faculty), and Mukul Dixit (NSD, Applied Physics), from the Fundamental & Computational Sciences and National Security directorates. The paper showcased the team’s preliminary research involving effective reconstitution approaches for cyber systems, including a mathematical formulation to provide a theoretical basis and an optimization problem as a vehicle to formulate autonomous reconstitution. Such solutions are proposed as a means of maintaining cyber-systems resiliency to keep critical infrastructure functional and responsive, especially during attacks. Early results showed promise for reconstitution of compromised cyber systems even when faults occur. The IEEE International Conference on Technologies for Homeland Security was held November 12-14, 2013 in Waltham, Massachusetts. The conference is considered the leading science and technology symposium devoted to homeland security. Reference: Ramuhalli P, M Halappanavar, JB Coble, and M Dixit. 2013. “Towards A Theory of Autonomous Reconstitution of Compromised Cyber-Systems.” In: IEEE International Conference on Technologies for Homeland Security (HST 2013), pp. 577-583. November 12-14, 2013, Waltham, Massachusetts. Institute of Electrical and Electronics Engineers, Piscataway, New Jersey. DOI: 10.1109/THS.2013.6699067.